We opted to dine in the Blue Ox Bar on the lower level of the Timberline, a small & intimate space with excellent pizza and some local microbrews on tap. It was hopping and we had to stand around until seats opened up but enjoyed our Multorporters from Mt Hood Brewing while we waited. The pizza was fantastic. We went to bed early hoping for some quality sleep, but unfortunately our night was interrupted by a small furry friend. I was awakened by the sound of crinkling wrappers in our room and Huckleberry was asleep, so I knew it wasn't one of us up for a midnight snack. I checked our food bags to find them fine, and hung them on the wall thinking that would be the end of it. Huckleberry woke up and groggily asked what I was doing, I told her I thought there was a mouse in the room. She dozed off again while I did battle with the little guy for another hour. Each time I got up to investigate more crinkling, I found the mouse into something else. After he jumped out of the bathroom trash can, I hung the trash liners. After he was interested in Huckleberry's pack I emptied it of wrappers and added them to the wall. At one point I found him on the desk, and I cleared off that surface too. Finally everything in our room was on a high shelf or hanging from hooks on the walls or doors, and I could go back to sleep in peace. It seemed ironic that the only night of our entire trip we have had to contend with rodents is the night we splurged on a fancy hotel room. At least we didn't lose any of our food. Stormy clouds do make for amazing morning light. Hikers get hungry. Yes I did eat all of that and more. 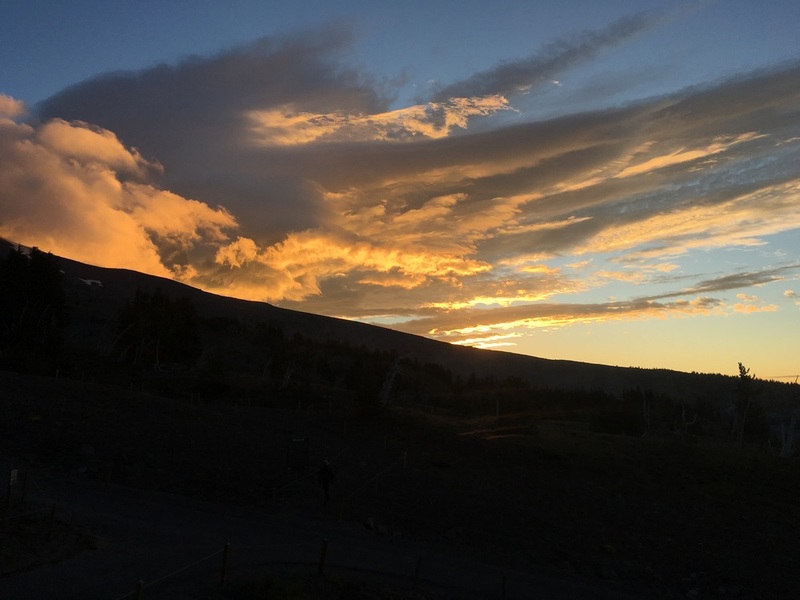 Day 34 started at the Timberline Lodge. I was awake early (trail habits die hard) and headed to the lobby for an early cup of fresh hot tea, where I was also treated to a stunning sunrise. It had stormed all night and the sky was still dark to the northwest but the clearing clouds to the southeast made for glorious morning light. 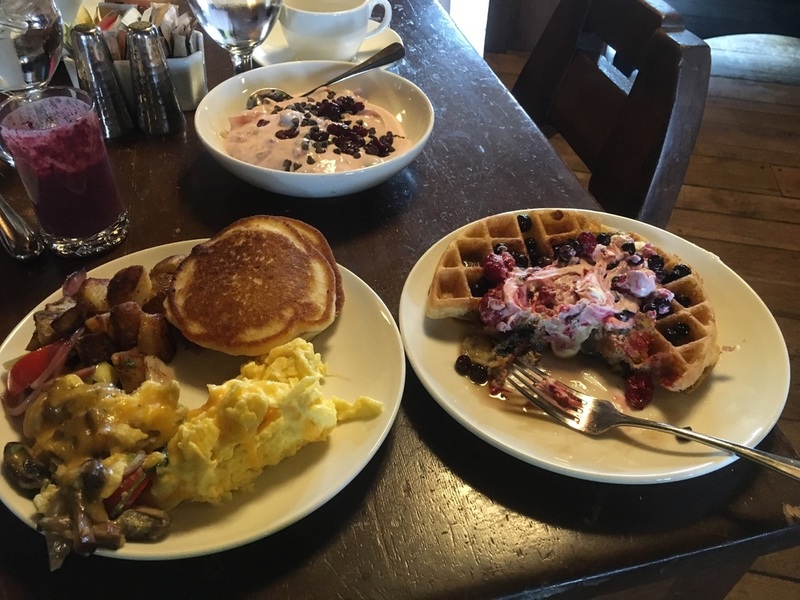 Huckleberry joined me and we headed for the legendary breakfast buffet. As promised, there was an abundance of fresh, tasty, and delicious items - the stuff starving thru-hiker dreams are made of. On the advice of the kid working the counter at the day lodge yesterday, we also ordered the Timber Toast. What arrived was an entire loaf of brioche-type bread dusted in corn flakes, oats and brown sugar then deep fried, served with strawberry jam and hazelnut praline butter! It came in two halves, and we each tackled one. It was delicious but incredibly rich and it's a good thing that we split it. After the buffet and the Toast, we had to hang out in our room for a while to allow some digestion time before we even considered hiking. Fortunately, it was grey and rained a bit more so it seemed like good timing. Huckleberry heading down the sandy slope of Mt Hood. 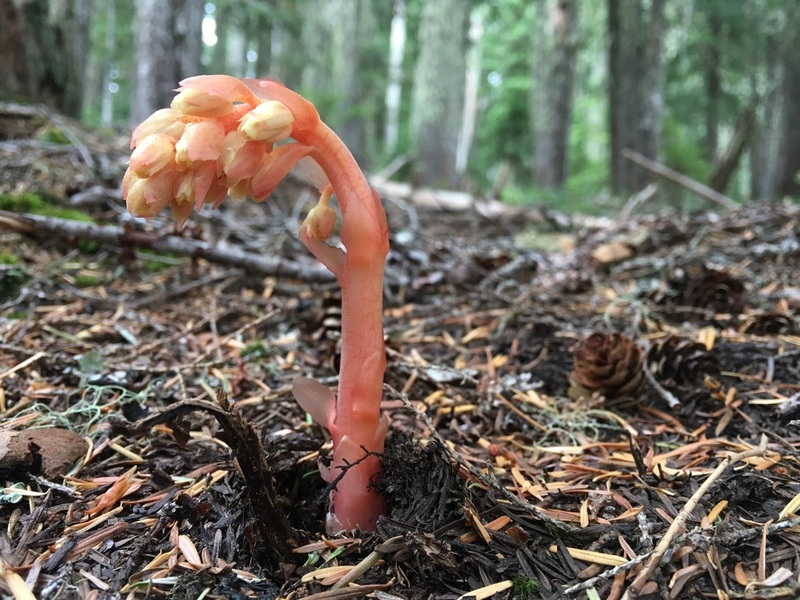 Snow plant emerging from the forest floor just before Barlow Pass. It was nearly noon when we hit the trail and we saw 3 hikers headed south just ahead of us. They moved faster that we did, though we saw them intermittently as we descended the open sandy slopes of Mt Hood and re-entered the forest. We crossed a highway at Barlow Pass and ran into the 3 guys sitting at a picnic table. We'd seen them at the lodge breakfast and learned that they were fellow SOBOs. They'd just scored bottles of beer from a local at the trailhead, and were enjoying a small lunch with this trail magic. We introduced ourselves and met Happy Feet, Long John and Delta. What's more, we learned that they had started the trail only 1 day before us and this was the first time we had crossed paths. It continues to amaze us how the trail can work like this. Happy Feet is most recently from Portland, OR, though he downsized his life to hike the PCT and has thoughts of moving east once he is done. He graciously let Huckleberry share a blessing from his happy foot talisman. Long John and Delta are cousins from the Bay Area, recent college graduates. They met up on the trail and have been hiking together since early in the trip. Their exuberant energy felt contagious and we immediately liked them. Fun fact: Barlow Pass is named after an Oregon pioneer, who constructed the first road across the Cascades in 1845-46. Northwest Palette on display, subtle yet vibrant and beautiful. Huckleberry modeling Our game changing defense against the rain, the Silver Shadow. Works on scorching sunny days too (so we are told). The remainder of the day was a mixture of two primary colors from the "northwest palette," green and grey. The green was the emerald tunnel, the term given to OR by many PCT thru-hikers as the trail is often below tree line with only rare mountain vistas. The grey came from constant clouds and mist. We were happily surprised not to start in the rain given last night's storm and this morning's sky, but by mid-afternoon a light drizzle had caught up to us. Despite being under tree cover, it was enough that we pulled out our Silver Shadow umbrellas and kept them up for several hours. By early evening, the rain stopped and just before we reached our campsite near the shore of Timothy Lake the sun even broke out of the clouds. We found an empty spot along the trail so set up our tents, and discovered that the lake is a popular local destination with many car-camping sites on the far shore, so there were heaps of people over there making a lot of noise. As we were setting up camp, Happy Feet, Long John, and Delta showed up. We had leapfrogged over the course of the afternoon and they decided to share our site. We chatted over dinner and got to know them a bit better. Although the sun had made a brief appearance during our tent set up and dinner, it started to rain again as we settled in for the night. A familiar trail friend on the West Coast, a Banana Slug. The ones back home are more yellow. Not sure about ripeness, didn't find out. Huckleberries! aka trail snacks along our Pinhead Butte traverse. We crossed another milestone moment, we've walked 600 PCT miles (plus some bonus ones for good measure) from Canada! The rain stopped just before we got out of the tent on Day 35, but the sky remained grey, the weather felt unsettled, and the air was cool. We felt a constant threat of rain as we packed up camp and hit the trail. The guys left just before us and we figured we'd see them at some point in the day. At a road crossing 4-5 miles into the morning we saw an RV parked near the trail with its generator running. A hand-lettered sign on the door read "PCT magic, hikers welcome" so we knocked on the door to find a chatty older thruhiker from last year. ADL (All Day Long) was offering a place to warm up & charge devices. We stopped in for a few minutes and he offered us a fresh apple each as we left! The trail continued through the emerald tunnel much of the day and was fairly uneventful. As we approached the Pinhead Buttes the sun made a brief appearance, however the clouds returned soon after. Traversing across the buttes we found plenty of huckleberries, the ripest of the trek so far, a total bonus and something to keep us occupied. On the south side of the buttes there was a small burn area and as we crossed it the sun teased us once again. Uncannily, as soon as we re-entered the forest canopy the clouds thickened and blocked the sunlight. 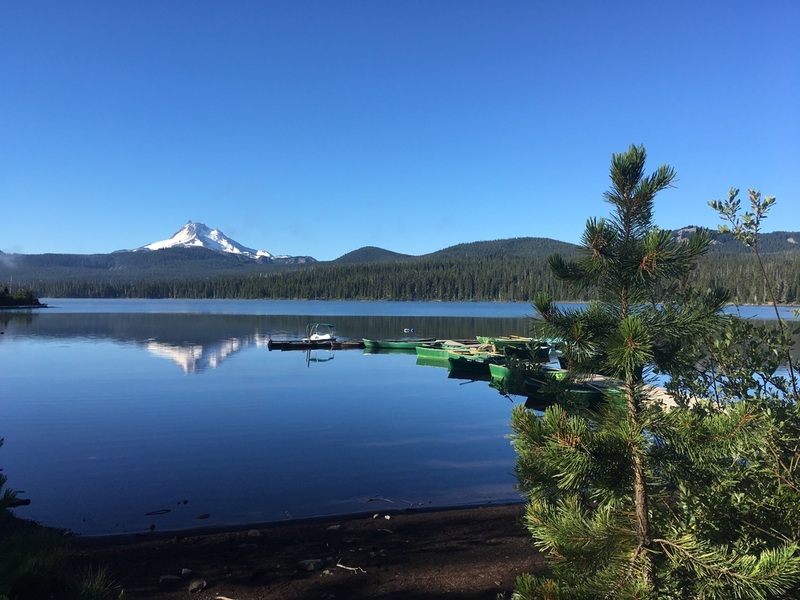 Mt Jefferson making a dramatic entrance at Ollalie Lake Resort. Welcome blue sky after the grey weather! We camped for the night at Jude Lake. The campsite was flat, private, and beautiful. The lake in contrast was small with a slight green tinge. I soon discovered that the coloration was from microscopic algae that quickly gummed up our filter, significantly slowing down the process of making water for dinner. Lesson learned. The good news is that back-flushing the filter solved our problem. We slept that night with the rain fly as the sky was still not trustworthy, but it turned out that we were overly suspicious and didn't get a drop of rain. We woke to a low damp mist on Day 36 and it continued as we started our morning hike in multiple layers. We were just a few miles from the Ollalie Lake Resort and we had high hopes for ice cream despite the cool temps. Just before reaching the store, we found Happy Feet, Long John and Delta lounging at their trailside campsite - we hadn't seen them all day yesterday, and found they had pushed long and hard to reach the store for beer at the end of a 30-mile day. They'd already been back this morning for hot coffee (Happy Feet is stoveless) and to enjoy the warm fireplace. We shared a laugh over their wanting something hot and us wanting ice cream. We walked through the developed campsite at the lake, passing easily 20 NOBOs camped there with lots of wet gear hung out to dry. It looked as though the weather had been wetter for them that it had been for us. Ollalie Lake was quite scenic, with low mist hanging over the water beyond the boat dock. We headed into the store to find them sold out of ice cream! Huckleberry wasn't interested in an Otter Pop (their only frozen item), so we settled for some chocolate cookies. I guess we'll have to wait until Bend for ice cream. As we paid the storekeeper, she excited pointed out the window, "our mountain is back!" Sure enough the mist had cleared and Mt Jefferson made a dramatic appearance across the lake.